Beany, A.H., P.J. Stoffella, N. Roe, and D.H. Picha. 2002. Production, fruit quality, and nutritional value of spaghetti squash. p. 445448. In: J. Janick and A. Whipkey (eds. ), Trends in new crops and new uses. ASHS Press, Alexandria, VA.
*Florida Agricultural Experiment Station Journal Series No. N-02141. Developing new kinds and types of vegetable crops is beneficial to both the grower and the consumer. Diversification of vegetable crops expands a growers market and simultaneously increases a consumers choice of vegetables. New cultivars can also improve fruit nutritional components. The objective of this investigation is to determine the adaptation and fruit nutritional content of two spaghetti squash (Cucurbita pepo L.) cultivars grown in south Florida. The traditional Vegetable spaghetti squash originated in Mexico/Central America (Maynard et al. 2001). Cultural practices can vary considerably because of the wide diversity of environments which spaghetti squash are grown (Zitter et al. 1998). Vegetable spaghetti squash production practices are similar to watermelon (Citrullus lanatus). Propagation begins with direct seeding and plants mature 80100 days after seeding, depending on cultivar and environmental conditions. The plants have a vine habit and fruit mature between rows (bare soil) rather than directly on the plastic covered beds. The original orange type spaghetti squash, Orangetti, was developed in 1986 at the Department of Vegetable Crops, Agricultural Research Organization, Newe Yaar Experiment Station, Israel in 1986 and released in the United States in the early 1990s (Paris 1993). 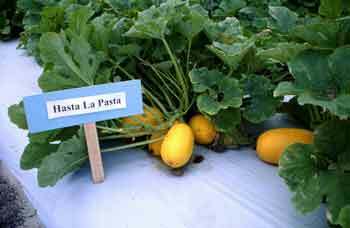 Hasta La Pasta (Seedway, Inc., Hall, New York) are very similar to summer squash (yellow and zucchini). Direct seeding on raised, plastic covered beds produce a marketable yield in approximately 80 days from seeding. The compact bush plant habit helps to keep the fruit on the beds. Both cultivars are harvested once. Minimal research and marketing have been conducted comparing the two cultivars. Spaghetti squash (Cucurbita pepo L., Cucurbitaceae) are typically grown as a winter squash. Most spaghetti squash are have cylinder-shaped fruit 1013 cm in diameter and 2023 cm long with rounded ends. The rind is hard and ivory colored at maturity. The traditional Vegetable spaghetti squash cultivar (Fig. 1) has a vining plant habit and matures approximately 90 days after seeding. Fruit are harvested once-over and offer an off-white flesh of crisp-tender strands resembling spaghetti. The flesh is very low in calories (50 per 100 g edible portion), an excellent source of folic acid, high in fiber, contribute a fair amount of potassium (369 mg), and small amounts of vitamin A (3700 international units) to the diet, but are very low in sodium (1 mg) (Food and Nutrition Solutions 1993). Fig. 1. Vining Vegetable spaghetti squash with fruit off the bed. The Hasta La Pasta spaghetti squash cultivar (Fig. 2) features a unique compact bush plant habit with small, oblong, deep orange fruit, 1820 cm long with a rich orange flesh (Anon. 1996). Fruit are harvested once approximately 85 days after seeding. The orange-type spaghetti strands are sweeter and less-bland in taste than Vegetable with a higher content of the provitamin A (carotene) (Beany et al. 1998). Fig. 2. Bushy Hasta La Pasta spaghetti squash with fruit and plant on the bed. 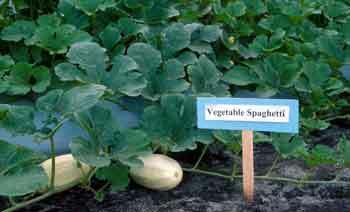 The University of Floridas Indian River Research and Education Center in Fort Pierce has been conducting traditional vs. orange type spaghetti squash cultivar trials for four years. During the 1999 fall season, the cultivar trial was conducted at Green Cay Farms in Boynton Beach, Florida. The experimental site was cleared and tilled. Approximately 38 t/ha of a yard trimming/biosolid compost was applied on Sept. 3, 1999. Fertilizer was broadcast at 71 N39 P44 K (kg/ha). Beds were constructed at 1.7 m centers. A center band of fertilizer, 283 N0 P279 K (kg/ha), was applied and beds covered with a clear polyethylene mulch. On Oct. 6, 1999, three weeks later, white polyethylene mulch was applied over the clear. Squash were seeded two seed per hill on Oct. 28, 1999, one row per bed with a 61 cm with-in-row spacing (Hamner and Stoffella 1996). If both seed emerged, plants were thinned to one seedling per hill. Plant population was equivalent to 7,687 plants/ha. Plots were 9.1 m long and consisted of 15 plants each. A randomized complete block experimental design was used with each cultivar replicated four times. Throughout the growing season, subsurface irrigation maintained the water level at about 35 cm below the soil surface. Applications of insecticides and fungicides were used on a weekly basis for control of insects and diseases. All pesticides were used according to recommended label instructions. All 15 plants of each plot were harvested Jan. 16, 2000. Fruit from each plot were counted and weighed. Mean fruit yield (no. and kg/ha) and mean fruit size (kg/fruit) were calculated for each plot. Each variable was subjected to an analysis of variance. Statistical analyses were conducted using the Statistical Analysis System (SAS) computer program (SAS Institute 2001). Typically, the Vegetable cultivar matures in 100 days and the Hasta La Pasta in 80 days (Anon. 1996). In this trial, both cultivars were harvested in 80 days. Marketable fruit yields, kg/ha, were significantly higher for Vegetable (15.3 t/ha) than for Hasta La Pasta (8.6 t/ha) (Table 1). Hasta La Pasta marketable number of fruit/ha was significantly lower than Vegetable squash. The higher marketable yield for Vegetable squash was partly attributed to its vine plant habit as compared with the bush plant habit of Hasta La Pasta. Perhaps higher plant populations for Hasta La Pasta would produce marketable yields more equivalent to Vegetable spaghetti squash (Beany and Stoffella 1997). Mean fruit size did not differ among cultivars. Table 1. Fall 1999 spaghetti squash yields and fruit quality analysis. zSignificant at the 5 (*) or 1% (**) level or non significant (NS), respectively. yFruit displaying physiological defects (discolored and disfigured) and size smaller than 0.68 kg, % weight basis. Both cultivars exhibited damage from the melonworm [Dinphania hyalinata (L.)], exterior fruit discoloration, and disfigured, bumpy, fruit. However, percent cull fruit did not differ among varieties. A nutrient and compositional sugar analysis were conducted on fruit from each cultivar. Individual fruit were peeled, longitudinally cut in half, and uniformly grated over the entire surface to a depth of about 5 mm. The grated tissue from each of the six individual fruit replications was used for the compositional analysis. Randomly selected tissue (10.0 g) were homogenized in 80% ethanol for 1 min at high speed using a Virtis homogenizer. The resulting slurry was immediately boiled for 15 min, cooled and filtered through Whatman #4 paper. The residue and original container were washed with an additional 80% ethanol and made to a final volume of 100 mL. About 5 mL were filtered through a 0.45 µm filter membrane before HPLC analysis using a Bio-Sil Amino 55 resin column (Bio-Rad Labr.) following the procedure of Picha (1985). Total carotenoids are an indication of beta-carotene content (Purcell 1962) which is a precursor of vitamin A (RDA 1980). The carotenoids were determined using a slight modification of the procedure of Reddy and Sistrunk (1980). Exactly 0.100 g tissue was extracted until colorless with 10 mL hexane using a Thomas E-40 tissue grinder (A.H. Thomas Co., Philadelphia, Pennsylvania). Samples were filtered through Whatman #1 paper and the absorbency read at 440 nm and compared to a beta-carotene standard curve. Total carotenoids were expressed on a fresh weight basis (mg/100 g). Beany et al. (1998) reported that total carotenoid content of Hasta La Pasta (1.82 mg/100 g) was significantly higher than for Vegetable (0.38 mg/100 g). Fruit N, Mg, S, B, Fe, Mn, and Zn content were not significantly different among cultivars (Table 1). Hasta La Pasta had lower fruit P and Ca content, but higher K and Cu content than the Vegetable cultivar. Hasta La Pasta fruit also had lower glucose and sucrose content than the Vegetable fruit. Cultivars did not differ in fruit fructose content. Vegetable fruit were significantly higher in percent dry weight and percent alcohol insoluble solids (AIS) as compared to the Hasta La Pasta. During a 1998 trial, a side-by-side taste test with in-store promotion of special signs, labels, and microwave cooked samples for tasting was conducted. Participants completed an appearance, taste, and texture survey after sampling each variety of spaghetti squash and were offered recipes. Consumers indicated that the appearance of the orange Hasta La Pasta squash was more eye appealing than that of the pale yellow Vegetable squash. However, consumers preferred the taste and texture of the Vegetable squash. The orange type was described as less sweet and bland. Of the consumers surveyed, 64.8% indicated they would purchase the Vegetable squash as compared with the orange type Hasta La Pasta squash, a contrast to Paris (1993) and Beany et al. (1998). Paris (1993) used the Orangetti cultivar and consumers sampled only the orange type spaghetti squash. During the 1998 supermarket promotion, 100% of the Vegetable spaghetti squash was sold as compared to less than 50% of the orange type Hasta La Pasta. Anon. 1996. Burpee vegetables: The commercial growers source for quality products, selection and service. Warminster, PA.
Beany, A.H. and P.J. Stoffella. 1997. Comparison of production, fruit quality, and consumer preference between vegetable and Hasta La Pasta spaghetti squash. Proc. Fla. State Hort. Soc. 110:389390. Beany, A.H., P.J. Stoffella, and D. Picha. 1998. Production, fruit quality, nutritional value, and consumer preference of spaghetti squash. Proc. Fla. State Hort. Soc. 111:221223. Hamner, A.M. and P.J. Stoffella. 1996. Production and consumer acceptance of an orange type spaghetti squash in Florida. Proc. Fla. State Hort. Soc. 109:291293. Maynard, D.N., G.J. Hochmuth, C.S. Vavrina, W.M. Stall, T.A. Kucharek, S.E. Webb, T.G. Taylor, and S.A. Smith. 2001. Cucurbit production in Florida. p. 151178. In: D.N. Maynard and S.M. Olson (eds. ), Vegetable production guide for Florida. Univ. Florida, IFAS, Extension, Gainesville. Paris, H.S. 1993. Orangetti squash in field, market, and kitchen. HortTechnology 3:9597. Picha, D.H. 1985. HPLC determination of sugars in raw and baked sweet potatoes. J. Food Sci. 50:11891190. Purcell, A.E. 1962. Carotenoids of Goldrush sweet potato flakes. Food Technol. 16:99. RDA. 1980. Recommended Dietary Allowances, 9th ed. Natl. Acad. Sci., Washington, DC. Reddy, N.N. and W.A. Sistrunk. 1980. Effect of cultivar, size, storage, and cooking method on carbohydrates and some nutrients of sweet potatoes. J. Food Sci. 45:682. SAS Institute. 2001. SAS/STAT users guide. Version 8.2. SAS Institute, Cary, NC. Zitter, T.A., D.L. Hopkins, and C.E. Thomas (eds.). 1998. Compendium of Cucurbit diseases. p. 187. APS Press, St. Paul, MN.